As many locals believe that this temple is a relic of the Lord Buddha, you will always find many devotees at this wat. As the temple is near the beach, you will enjoy the sea breeze and shopping opportunities. Nearby shops and stores sell a number of locally made art, crafts, and souvenirs with visitors often enjoying shopping for bargains. Short Description: The small Wat Sila Ngu temple also known as Wat Ratchathammaram is located at the top of Hua Thanon beach in the south of Koh Samui. 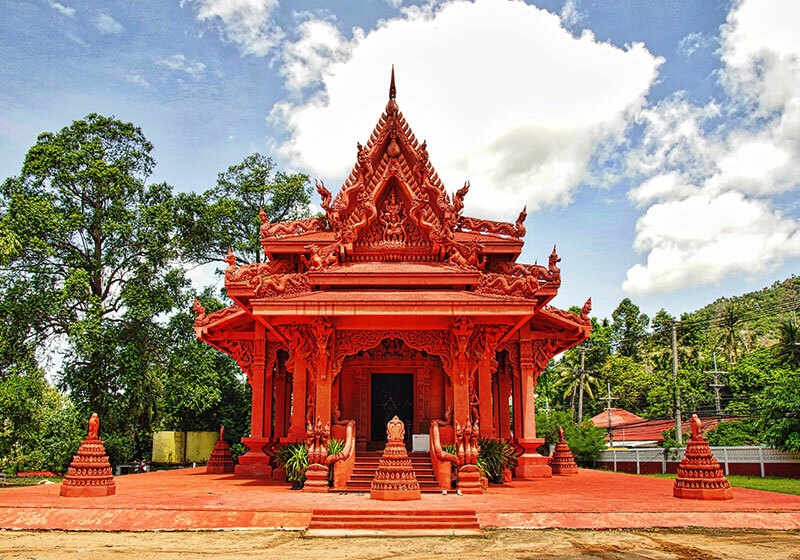 The stone snake pagoda, ''Phrataht Hin Ngoo'', its nickname, hosts a beautiful red ordination hall with beautiful sculptures in relief on the exterior and interior walls.